Every so often, an album comes to you, out of nowhere, and you decide to listen to it. A friend didn't recommend it, you don't know anyone in the band, you've never even heard of the band, you opened up a promo email to check out a different band... whatever the case, it was nothing more than a desire to try something new, nothing deeper. And so you throw it on in the background while you drink your coffee and play with your dog. And you're focusing on your dog, and playing fetch in your apartment, but you keep getting distracted by this music you've put on. So after you tire your puppy out, you get another cup of coffee and sit down to properly listen to the music, this mysterious album that took you off your fetch A-game. And what you discover is something like nothing you've really heard before, something with familiar pieces but a fuzzed out, unknown whole. Something like if Bon Iver decided to make a Red Fang album (Stoned Iver? ), or Sufjan Stevens put his energy into distortion pedals instead of quirky, paragraph-long song titles. What you've discovered is Lightsabres, the one man project of J. Strömshed from Sweden, and his album Hibernation. Hibernation wastes no time in letting the listener know what they're in for. The title track opens with a quiet, introspective melody, then brings in that good ol' fashioned stoner crunch, before J. Strömshed arrives, fuzzed out, distorted, and bereft. The chorus of "Everything's wrong/So sing me a song/Until it's all gone," wailed over densely distorted guitars, is more or less the backbone of Hibernation; everything the album does springs forth from the ideas on the title track. The album definitely leans into the trappings and tropes of stoner rock; fuzzed out guitars and vocals abound throughout the album. Buried beneath the distortion is an overwhelming sense of melancholy, conveyed through Strömshed's dark lyrics and - in the moments when the fuzz is scaled back - achingly beautiful voice. Songs like "Cascades of Blood" and "Whisper to Me Softly" are tender ballads that become despairing when you listen to the lyrics, while simultaneously being among the catchiest songs I've heard all year. 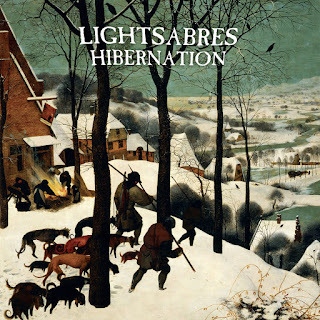 Only one of Hibernation's twelve tracks break the four minute mark, and though I've long been a proponent of lengthy songs, Lightsabres uses the short form format to perfection. It's rare that the shortened, radio-friendly song length pop sensibility is used to such a sterling result; Hibernations feels like an audio photo album, each song acting as a snapshot of sadness. And while the music may spur hope for happier times, Strömshed's lyrics and gut-wrenchingly anguished vocals betray the hurt and pain layered beneath Lightsabres' music. If you like a bit more emotional variance in your albums, then this one admittedly might not be your cup of tea, but if you're willing to wallow in sadness and scorned love for a bit, then Hibernations is absolutely for you. Hibernation came out of nowhere to me, and I haven't been able to stop listening to it since that morning a few weeks ago. It's an absolutely stunning achievement, an album that relishes aching sadness in a genre that's typically all about the party, and the way J. Strömshed manages to wrap his songs of desolation in perfect flourishes of guitar is outstanding. And then there's his voice. I truly can't think of anything I've ever heard that's like this, and I can't wait to dive into the rest of Lightsabres' discography. I just have to stop listening to Hibernation first. If you're looking for a jump start on your autumnal-sounding albums of sorrowful pontifications on death and despair, but still want a little bit of that energetic summer crunch, this is your album.